An early plannin map of Von King Park, Brooklyn. 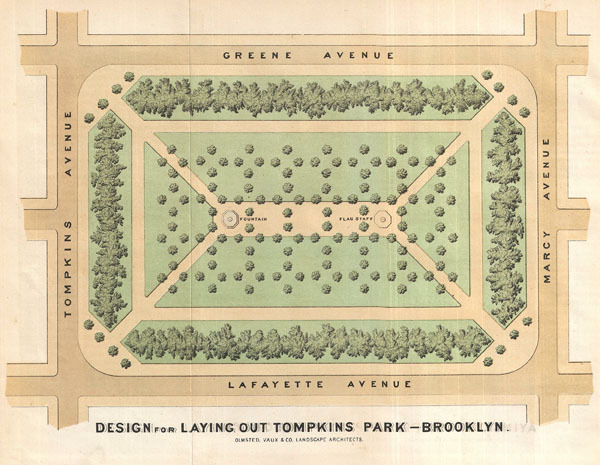 Design for the Laying Out Tompkins Park - Brooklyn. A rare 1871 example Vaux & Olmstead's map of Tompkins Park or, as it is now known, Herbert von King Park, Bedford-Stuyvesant, Brooklyn. Von King Park is one of Brooklyn's earliest parks. This map depicts the park as a whole and includes pathways, individual trees, and fountains. The streets and avenues surrounding the park are also noted. The layout of Von King Park shown here reflects Vaux and Olmstead's 1871 design. Like their most famous works, Central Park and Prospect Park, Vaux and Olmstead were meticulous in their design of the park, with every tree, pond, and bench planned. Olmstead wrote: 'Every foot of the parks surface, every tree and bush, as well as every arch, roadway, and walk and been placed where it is for a purpose.' Today, because of Vaux and Olmstead's efforts, the citizens of Bedford-Stuyvesant have the privilege of enjoying a fine urban public recreation area in New York City.